We are newspaper workers who have been on strike since July 13, 1995 against the Detroit News, owned by Gannett, and the Detroit Free Press, owned by Knight-Ridder. We were forced to strike by these greedy billionaire newspaper chains who are out to bust our unions and deny us and our families a decent livelihood. Gannett and Knight-Ridder are demanding the elimination of hundreds of our jobs as well as takeaways that would gut our contracts. In a public statement made a month after the strike began, Robert Giles, Editor and Publisher of the Detroit News, said: "We're going to hire a whole new workforce and go on without unions, or they can surrender unconditionally and salvage what they can. " That has been the publishers' position from the beginning and it has not changed in all these months. They are taking heavy financial losses in Detroit as a result of the strike but they are prepared to absorb such losses to achieve their main objective: bust the unions. We believe the labor movement can stop them, that the Detroit newspaper strike can be won through labor solidarity and strength demonstrated in a massive national mobilization of the entire labor movement. 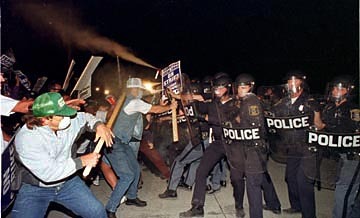 At its August 1996 meeting, the AFL-CIO Executive Council considered a proposal for a National Labor March on Detroit. Although the proposal was endorsed by the Metro Detroit AFL-CIO and the Metropolitan Council of Newspaper Unions (made up of all striking Detroit newspaper unions), the AFL-CIO Executive Council did not issue a call. Now that the national election campaigns are over, we are appealing to unions around the country and supporters of our strike to join us in urging AFL-CIO President John Sweeney and the Executive Council to reconsider. A national labor march on Detroit will show Gannett and Knight-Ridder that all of labor supports this struggle -- physically as well as financially. And it can help spur united labor actions in cities around the country directed against Gannett and Knight-Ridder facilities, including USA Today. We believe we must act now because the future of the labor movement will be critically affected by the outcome of this strike. After all, if corporations like Gannett and Knight-Ridder can break unions in a labor stronghold like Detroit; What union anywhere is safe from similar union-busting? It's time for Solidarity Day 111, this time in Detroit. Please send a message to AFL-CIO headquarters in Washington, D.C., urging a national labor march on Detroit in support of striking newspaper workers. And please send a copy to us. We deeply appreciate your continuing support. Newspaper Guild of Detroit 3300 Book Bldg.